Little Mrs. Married: Support & Love for Sandy Hook. Please join us today and everyday as we pray for the families of the victims of the Sandy Hook Elementary tragedy. Today started the first of many funerals, and I am praying for peace & comfort to fill the hearts of those who were the most affected by what happened last Friday. Pay it Forward, the followup, by Kelly at Kelly B., J.D. That last one you especially should read if you are a teacher or parent of a child who is in public school. I just found it encouraging & so, so true (even though i'm not a teacher OR a parent...i have a heart for both). Sorrynotsorry this hasn't been very silent. I am sure you all understand! 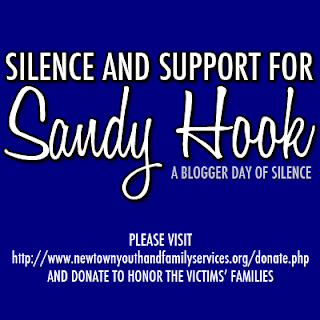 I just wanted to mention the above which is all in support of the people of Newtown. I have been doing a lot of praying. And crying. My heart is FULL of love & compassion & sadness for the people of Newtown. I know yours is, too.